George dei Conti Stagno Navarra, the ALPS Council President, was born at Balzan on the 6th day of July 1944 , and is the sixth child of a family of ten, made up of four brothers and five sisters. He grew up in a quaint village and continues to carry the childhood memories of a serene village life that has always given to him great satisfaction in his life journey. He started his education in a Government primary school at Lija and then passed an entrance examination to start his secondary higher education at The Lyceum in Hamrun. From late fifties to early sixties, George has studied at the Liceo until he obtained his GCE “O” Level passes in 1962. At a later stage he also studied and passed accountancy examinations which helped him in no small way during his working career. In 1963 he joined the firm C. & H. Bartoli Bros which later became a limited liability company and continued to expand and increase its work force. He has worked for the same firm until his retirement in 2008, both in the import sector as well as the insurance arm of the same company which saw him reach his retirement in the post of Executive Sales Manager. From a junior insurance clerk operating from a tiny office in Valletta, George’s ambition saw him first become an insurance surveyor and assessor for motor, marine and other lines in the insurance sector that has taken him to greater heights within the insurance field. The Bartoli Company continued to expand and George very successfully started a sales and marketing exercise which enabled him to put a few million pounds of different products in the local as well as the foreign markets. The last ten years before reaching retirement age, George had often travelled and tapped the Libyan market which rendered large orders. He had originally started his working career in insurance. In later years it saw him go back to his books, studying for a Thatcham Motor Surveyor’s diploma which ended successfully in the year 2000 after two years of intensive studying and graduation. After his retirement from sales, he now still works for Elmo Insurance Ltd an associate company of C. & H. Bartoli Ltd. Motorcars have always been his greatest passion whilst rendering a service with the insurance surveying. It keeps him active and busy to the present day. George loves DIY and he often picks his tools to tackle odd jobs around the home and his motor car of course. Writing poetry in Maltese and English inspires him to put together in a book someday, all the short poems that have been scribbled over the years. Perhaps, the best thing that happened in his life and which he recommends to everyone, was the day when he gave up smoking in 1978 and which made him feel much healthier ever since. For a number of years George had served in the ‘ Kings Own Malta Regiment’ up to the time when the territorial army was disbanded in 1972. Of course, he still carries great memories from his younger days as a soldier and remains active in the K.O.M.R. association. Although numbers keep dwindling because of old age, George attends to most events that are organized each year when soldiers meet and recall the good old territorial week-end training camps and ceremonial parades that were held at the army barracks in Fort St Elmo Valletta as well as Ghajn Tuffieha. George is also a member of The Catenian Association of Malta ( Mensija Circle 294) and has served on its council as Chamberlain and also as Vice President. Worth mentioning, George helps in the San Girgor Parish / Sliema where he resides. Lesson readings during Holy Mass and other ecclesiastical ceremonies remain his favourite week-end chores that helps keep him closer within the Roman Catholic community. George married Madeleine née Mifsud in June 1969. The couple have a son and three daughters – Karl, Rebecca, and twin daughters Petra and Camilla – and are the proud grandparents to Matthew, Valentina, Faye and Julian. Joseph D Buttigieg started his primary education in 1946 at St. Joseph’s High School in Valletta. He attended the Lyceum between 1951 and 1956 in the old premises at Hamrun and Valletta. He was also a Scout with the Lyceum Scouts Group. In 1957, he joined as a Gunner with 11th Regiment, Royal Malta Artillery (Territorial), and in 1965, he relinquished his military service having attained the rank of Warrant Officer II (Battery Sergeant Major). He attended courses in COBOL Programming at Stafford House Computer College, London, (1967) graduating with a Diploma in EDP; Business Administration at the Malta College of Arts and Sciences, (1969); and Canadian Studies at the University of Toronto, (1985). Between 1968 and 1987, his continuing education focused on economic theory and management practices. He started his career in 1957 as an Emergency School Teacher. Between1964 and 1968 he relocated to London where he held various executive positions in computer programming, systems analysis, and production management. On returning to Malta in 1968, he joined the Malta Development Corporation as Projects Executive. This carried with it various appointments to the Board of Directors of companies receiving aid from the MDC. In 1979, on his relocation to Canada, Burroughs Corporation (Canada) employed him as Plant Manager. In 1981, he was appointed Managing Director of Aladdin Canada Inc. On his retirement in 1996, he relocated to Malta. His past memberships in professional and business associations include Secretary of the Malta Institute of Management, Member of the British Institute of Management, Committee Member of the Institute of Directors, and Member of the Board of Trade of Metropolitan Toronto. 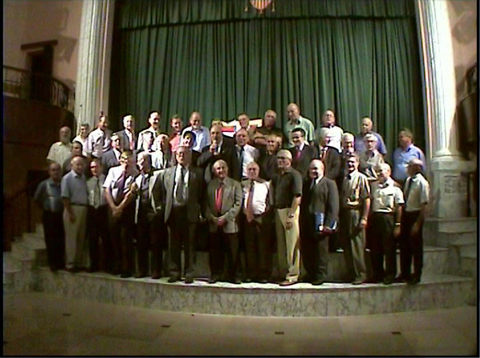 Past memberships in civic and other organizations included President of the Catenian Association Mensija Circle, Vice President and Treasurer of the Catenian Association Mensija Circle, Treasurer of the Catenian Association Malta Week Committee, Treasurer of the National Federation of Parent Teachers Association, Member of the Association of Model Engineers, Member of St. Andrew Society, Member of the Malta Scout Fellowship, Founding Chairperson of Savio College Parent Teacher Association, Member of an ad hoc Committee appointed by the Malta Red Cross, Election-day Vice Chairperson of the Conservative Party Scarborough Riding, and Member of the Canada Works Advisory Board, He also had various guest speaking engagements on management with Maltese and Canadian Corporations. Presently he is Deputy President of the Committee of Administration of the Association of Lyceum Past Students (ALPS), Chairperson of Culture, Welfare and Benevolence Commission of ALPS, Council Member on Malta Area Council of Catenian Association, Member of the British Legion (Malta Branch), Council Member of the Catenian Association Mensija Circle, Member of 3/11 Regt RMA (T) Association, Committee Member and Parade Marshall of the George Cross Island Association, Knight Commander of Grace of the Sovereign Hospitaller Order of Saint John, Deputy Information Officer SHOSJ, Member Information and ICM Board SHOSJ, Editor International Newsletter SHOSJ, Chairperson Social Events Committee SHOSJ, and Fund Raiser for the Monastery of St. Ursula of the Cloistered Nuns of the Order of Malta. His favorite pastimes include military history, antique Maltese furniture and sacred art history, restoration of Maltese antique furniture, gilding and restoration of gilded ecclesiastical objects d’art. In 1961, he married Pauline, nee Galea, and they have two professional sons Bryan (Environmental Lawyer) and Jonathan (Civil Engineer). Their extended family includes daughters-in-law Patricia and Domenique, and grandchildren Douglas, Robyn, Rachel and Rebecca. Another grandchild, Benjamin, met the Risen Christ to join God’s choir of Little Angels at the tender age of four. Alexander Borg, Secretary-General, was born in Hamrun on 23rd March 1945 and attended The Lyceum from 1956 until the completion of his A Levels in 1962. The following year he took a Management Course at MCAST, then won a scholarship to study Hotel Management at ENALC College in Rome from 1964 to 1966. .
Up to 1993 he held managerial positions in various hotels in Malta, including over 20 years as General Manager. Since then he has been the Managing Director of two companies he founded himself, Studiomoda Ltd and Interpoint Design Ltd, both involved in the importation, design and manufacture of contemporary furniture. Alex is a member of the Institute of Management, the Malta Chamber of Commerce, the Malta Tourism Society, the Association of General Retailers and Traders and Malta Enterprise. Alex married Sonia née Spiteri in February 1971. They have two sons, Mark and Matthew, and are the proud grandparents of Sarah, Luke, Nicole and Lauren. PETER G.TORTELL, Assistant Secretary & Public Relations, Peter was born in Sliema on 14 April 1935, and attended the Lyceum between 1947 and 1953. Between 1953 and 1955, he worked as a Clerk in the Office of the Prime Minister, which was situated, at the Auberge D ‘Aragon. Between 1955 and 1963, he worked as a Clerk in the General Staff Branch at Castille with the War Department. In 1957, he obtained a Higher Accountancy Diploma from the London School of Accountancy. He was the Accountant at Malta Synthetics Ltd, and then Director and Financial Controller with International Fibers Ltd. (1965-1971). He was Director and Financial Controller with Melita Knitwear Ltd. (1968-1971). In 1971, he joined Mediterranean Flower Products as Director and Financial Controller and in 1982, he was appointed Managing Director. He joined Medigrain Ltd. as General Manager in 1990 and retired on pension in 1996. In his youth he was a Boy Scout with1st Sliema Group and attended a Scout world Jamboree in Bad Ischl, Austria, in 1951. He was also a member of the Catholic Action in St.Gregory the Great Parish Church. From 1958 to 1968 he served with 11 HAA Regiment RMA(T) – later amalgamated into 3/11 Regiment RMA(T)- and was commissioned as Second Lieutenant in 1960. There has always been a very sporting side to Peter. In football he was captain of the Lyceum team and also of the Combined Government Secondary Schools team. He played with Sliema Shamrocks from 1949 to 1953 and was in the winning team that won the Amateur Cup in 1953. He also played for the junior teams of Sliema Wanderers. Between 1973 and 1975, he was a Committee member of Sliema ASC and Council member of the Amateur Swimming Association. For all of 25 years from 1975 to 2000 he was Honorary Treasurer of the Amateur Swimming Association. He was the Director of Finance of the Malta Olympic Committee from 1993 to 2004. Peter has been a member of the Parish Council of Jesus of Nazareth Parish Church since it became a Parish in September,1973, to date and was the Moderator of the Council for over 20 years. He has been serving as a Member of the ALPS Council since 2008. Peter married Louise nee’ Vella in 1958, who sadly passed away in 2009. They had two sons and a daughter, Simon, Angela and John. Simon, who sadly passed away in 2012, married Silvana nee’ Grech and they have three children – Elena, Alexandra and Ana. Angela married Kenneth Micallef and they have three children – Nicholas who is married to Olivia Camilleri, Gareth and Tricia. John married Aida nee’ Lapira and they have two children – Jessica and Christina. David Abela, Treasurer, was born in Msida on 2nd August 1945. He was admitted to The Lyceum in Hamrun in 1956 and left from Form VI in 1962, after achieving his GCE at Ordinary and Advanced Levels in languages and mathematics. Among his classmates were such personalities as Tony Nicholl, Enzo Gusman and Richard Vella Laurenti. David started working life as a supervisor in the textile industry, followed by reception and book-keeping duties in the hotel industry, before joining C. & H. Bartoli in 1966, where he retired as General Manager. His favourite hobbies are reading, swimming, canoeing and walking. David was co-opted to the ALPS Council of Administration by Dr Guido Saliba, his former History teacher, in 2000. He married Josephine née Chetcuti in August 1972 and they have two daughters, Claire and Louise. Claire (B.Pharm.) has something in common with her father about The Lyceum: in fact she teaches Sciences there. Oscar Galea, St.Anne Chapel/Pwales, was born in Santa Venera on 9th October 1943 and received primary education at the Preparatory Secondary School (Montessori), Sliema. In 1956 he entered The Lyceum at Hamrun and in 1961 concluded his studies with six GCE “O” Level passes. He joined the civil service in 1963 and worked at the Posts & Telephones Department until 1968, when he was transferred to the Central Office of Statistics to form part of the administrative team to carry out the first-ever Household Budgetary Survey in Malta. In 1977 Oscar was assigned duties with the Social Statistics Division of the Central Office of Statistics, carrying out various statistical surveys and studies. In 1998 he underwent training on gender statistics under the tutelage of the Dr Pehr Sundstrom, gender statistics expert at Statistics Sweden, and in 1999 co-produced the publication Women and Men – an in-depth presentation of gender-related statistical indicators on women and men in Malta. He was appointed Unit Manager of Education Statistics and Culture following the Central Office of Statistics’ take-over by the National Statistics Authority. He attended several conferences and workshops related to education and culture in Brussels and Luxembourg, and was instrumental in the introduction of new methods and techniques in data collection and compilation. Oscar’s hobbies include reading, woodworking and static scale model aircraft. He married Maria née Pace in October 1970 and they have two daughters, Christine and Stephanie. Nazareno Azzopardi MD, DA, FFARCS, Dip. Rel. Studies, Philanthropic Projects, was born in Lija on 2nd February 1938, and attended The Lyceum at School Street, Hamrun from 1948 up to Matriculation in Valletta in 1954. After graduating as a Medical Doctor from the Royal University of Malta in 1961 he received a Diploma in Anaesthesia from the UK Royal College of Surgeons in 1965, following that up with a Council of Europe Fellowship in Paediatric Anaesthesia in 1970 and a Fellowship in Anaesthesia from the UK Royal College of Surgeons in 1975. In 2003 he received a Diploma in Religious Studies from the University of Malta. 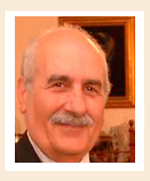 Dr Azzopardi has been Senior Lecturer in Anaesthesia at the Malta University Medical School since 1977 and is a Founder-member of the Association of Maltese Anaesthetists, set up in 1983. He is also the editor of the Acta Anaesthesiologica Melitensis. Dr Azzopardi married Grace née Cachia in January 1966. They have four sons – Paul, Mark, Thomas and James – and seven grandchildren. Mr Alfred Agius Membership Commission,was born in Zebbug on 4th October 1950 and attended The Lyceum between 1963 and 1968. He qualified from a public exam and enrolled with Customs on the 12th May 1970 where he acquired sound knowledge of the Department on account of being posted to various key sections along the years. In fact he participated with success in all the in-house seminars and study courses held along the years of service. In 1992 he was promoted to the rank of Inspector of Customs. Mainly this post demanded leadership skills and invoked responsibilities over the Officers manning the Air and Sea passenger terminals on twenty four hours shift basis on six monthly alternate periods. In October 1993 he enrolled for a University three-year part-time course from which he graduated in 1996 obtaining a diploma in Management Studies. In October 2006 he was promoted to Senior Inspector of Customs at the Customs Legal Office. In May 2007 he became one of the five newly appointed Customs Managers who qualified through an internal selection process. Taking into account his accrued experience, the Department assigned its Legal Unit to his charge rather than posting him to any of the other management posts. In fact he continued to manage the Customs Legal Office until his retirement from Customs service on September 2011. Joe Micallef, Lyceum Scouts and Youths Co-Ordinator, was born in Hamrun on 23rd August 1945. He was trained as a professional teacher at St. Michael College of Education in 1969-71. He served as a teacher in various schools in Malta. He spent twenty years teaching Mathematics at the Lyceum in Hamrun untill 2003, when he was transferred to his last posting as Assistant Head of the F.X. Attard Boys’ Secondary School at Marsa. He has since then retired and served as the President of the Parent Teacher Association at Zebburg Secondary School. In all his years at the Lyceum Joe was a committee member and photographer of the Lyceum Publications, and has been a member of the organising committees of several editions of the Lyceum Bicycle Marathon. Since 1991 he has been a member of the Lyceum Scout Group and its Liason Officer with the school administration and Parent Teacher Association. It was for this reason that he joined the ALPS Council of Administration when the Group Scout Master Alex Bonello could no longer attend. He has taken various courses in First Aid and Health and Safety, and served as a Health and Safety Officer at the Lyceum. 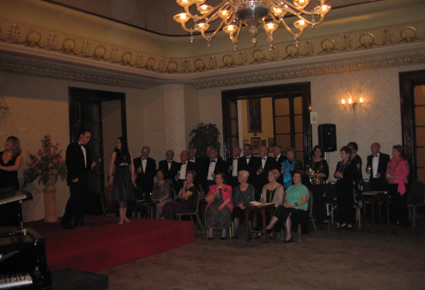 Joe participated in the organization of ALPS activities and functions while they were held at the Lyceum. He has always been an active member in pastoral work in his Parish and Kana Movement, organising annual courses and conferences. He served as a Signaller with King’s Own Malta Regiment untill it was disbanded in 1972. Joe married Margaret nee Portelli in December 1974 and they have two sons, Mark and David. They have lately become the proud grand parents of Amy, Thomas and Luke. Fr William Bartolo, OFM Conv.,Spiritual Director, was born in Floriana on the 9th January 1958. He attended Floriana Primary School and later the Sir Temi Zammit Secondary School in Naxxar. 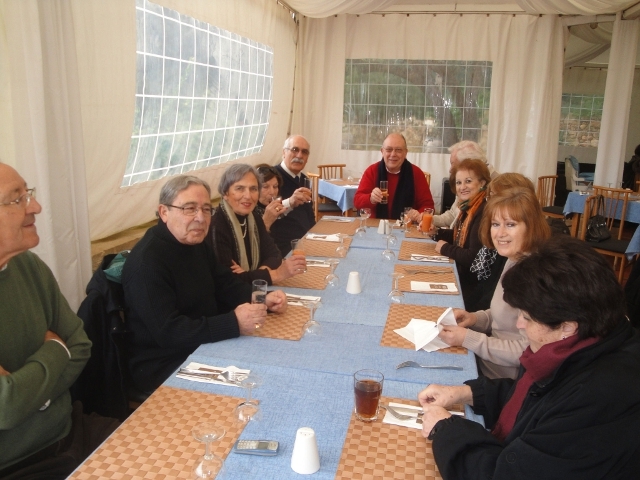 Concluding his school days, Fr William performed his duties in the Hospitality Industry in Malta for some years at the conclusion of which, in 1981, he persued his vocational trail, by entering the Franciscan Seminary studies in Birkirkara. He was ordained Franciscan Conventual Monk on the 6th July 1990 and a year later he was appointed as Spiritual Director for the Lyceum ( il-Liceo ) in Hamrun. .
During the following ten years he was active and assumed new responsibilities on the Commission for Pastoral Work to Workers Welfare within the Maltese Diocese. 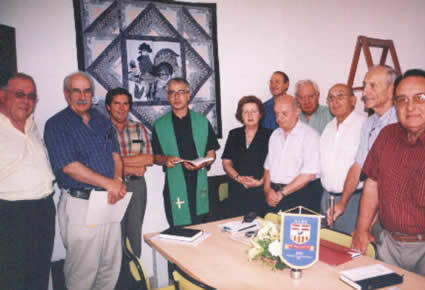 In 2001, Fr William was solicited to assume responsibility as Spiritual Director, by the late Dr Guido Saliba, the Founder President of the Association of the Lyceum Past Students – A.L.P.S., a position which Fr William accepted with a sense of honour and altruism. Besides covering the spiritual needs of the Association during the year, he looks forward to the monthly mass at the Pwales Chapel, which is maintained by the Association, for the benefit of both the Pwales Community and ALPS Members and their friends, as well. Milo Vassallo, President of the ALPS Branch in Canada, was born on 10th September 1934 at Sliema and attended The Lyceum at Hamrun from 1946 to 1949 and Valletta from 1949 to 1951. From 1951 to 1975 he worked at Cable & Wireless, which then became Telemalta Corporation, and he stayed on until 1979. During his stint with Cable & Wireless he was seconded to Lagos from 1957 to 1958, London from 1959 to 1961 and Tripoli in 1962. Milo and his family emigrated to Toronto, Ontario, Canada in January 1979. From then to 1987 he worked at various jobs with Gulf Canada and Petro Canada. He joined the Consulate General of Malta as Administrative Officer from January 1988 to August 1988 and was then appointed Consul General of Malta in Toronto from September 1988 to 1996, being reappointed Consul General on 1st January 1999. He retired from his post as Consul General on 1st October 2006. 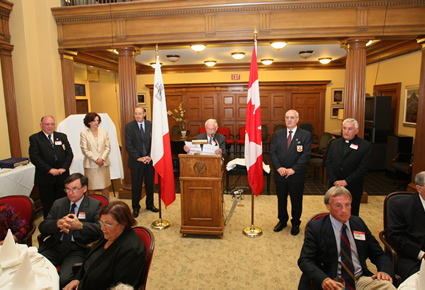 Milo’s career has brought him very close to the Maltese-Canadian community, where he had the opportunity to get involved in many community and church events and assist the Maltese Canadian community in its many needs. He was one of the ten persons on the organising committee of the 75th anniversary of the founding of St Paul the Apostle Parish Church in Toronto. During his tenure of office as Consul General he was also responsible for the promotion of Malta both for trade opportunities and as a holiday destination. Retirement from public service has certainly not meant the end of the road for Milo. He is still Chairman of the Social Committee of the Consular Corps Association (since 1990); Treasurer of the Consular Corps Association of Toronto (since 2003); Treasurer of the European Travel Commission (since 1989) and President of the International Trade Club (since 1994). In 2006 he was appointed Executive Director of the International Trade Club and in 2007 was appointed to the Board of Directors of EUCOCIT (European Union Chamber of Commerce), representing the MCPBA (Maltese Canadian Professional Business Association). Milo Vassallo is also an active and involved member of the British Chamber of Commerce, the German Chamber of Commerce, the French Chamber of Commerce and the Export Club of Toronto. He is a member of the Board of Trade, the Ontario Club, the National Club and the Royal Canadian Military Institute; a trustee of the Eden Foundation (Malta); and a corporate representative of IIM Consultants, Malta. In 2007 he founded Milo Vassallo and Associates, of which he is President and CEO. Milo is married to Rita née Gauci and they have an only daughter, Lara Maria. Oreste L. Aquilina JP foundation member and Secretary of the Association of Lyceum Past Students NSW Branch, was born in Siggiewi on 7th February 1937. After attending The Lyceum from 1950 to 1955 and completing his GCEs. he worked for the Water & Electricity Department for about 10 months as a clerk-typist before emigrating to Australia in 1956. He obtained a Personnel Management certificate in 1977 and over the years during his employment with the Australian Government Departments (Postmaster General’s Department, Primary Industry and Defence-Navy) he undertook a number of finance and administrative courses. He was awarded the Department of Defence 30 years’ service medal and retired from the Australian public service after 40 years. From 1980 he worked part-time as freelance interpreter and Special Broadcasting Service TV subtitler, working on such features and episodes as Is-Salib tal-Wied, Il-Hadd fuq il-Bejt, In-Neputija tal-Kappillan, Il-Kap Jien Tikkmanda Hi, Operation White Dove, Triq Wahda, Issa Naraw, Mera tal-Passat, Ipokriti and others. He was also a part-time broadcaster on SBS Radio and the Maltese Community Council 2SER FM program. Oreste certainly kept himself very busy with extracurricular activities. From an early age he was interested in welfare, and before emigrating to Australia he was on the executive of the Siggiewi branch of the Young Christian Workers (ZHN). 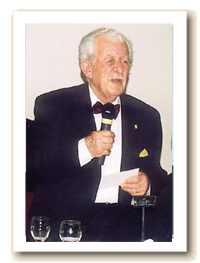 In Australia in the early 1960s he was a member of the Catholic Youth Organisation, President of the Stella Maris Club and later became President of the Maltese Guild of Australia (where he initiated the move for dual citizenship for the Maltese living in Australia), as well as holding other executive positions. He was Secretary and Treasurer of the Maltese Community Council of NSW and the originator, driving force and Chairman of the Australian-Maltese Bicentennial Commemorative Memorial (AMBCM) that built the bicentennial Memorial at Pendle Hill (a project funded by the Governments of Malta and NSW, Holroyd Council, Maltese associations and public donations). He was Secretary of the United Council of Immigrants (initiating the teaching of foreign languages in schools and lobbying for reduction to 10 years for eligibility and transferability of pensions), co-founder of the St Nicholas Festa Committee and President for some 18 years, until 1997. He was a founding member of the Maltese Cultural Group and the only non-playing President of Our Lady Queen of Peace Parish Band at Greystanes. Besides being a life member of the Catholic Club, he is an honorary member of the South Sydney Juniors Rugby League Club and an Honorary President of the St Nicholas Festa Committee. Since retirement he became more involved in choral music, and is a member of the Beethoven Society of Australia, Macquarie University Singers, Sydney Philharmonia, Manly-Warringah Society and other choirs. Oreste is recognised by the National Accreditation Authority of Translators and Interpreters and is a Justice of the Peace for the State of NSW. 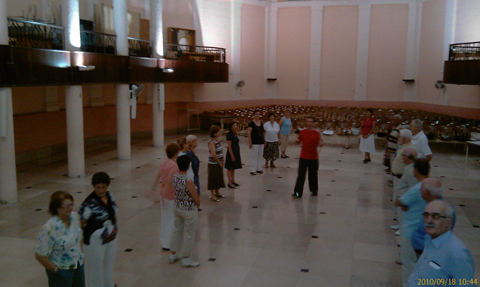 His hobbies include choral singing (he sang with Pavarotti in Stockholm in June 1999), occasional painting and computer surfing, besides following basketball and doing some reading, particularly in Maltese. He married Australian-born Margaret Kelly in October 1966. They have one son and three daughters – Mark, Michelle, Simone and Nicole – and are the proud grandparents of one granddaughter, Kianna, and one grandson, Declan. Fr Albert Felice-Pace OP is making great efforts to set up ALPS on a strong footing in the Western United States of America. He was born in Hamrun, the third of seven children, and attended the Hamrun Primary School and then The Lyceum from 1947 to 1953. In 1952 he joined the Dominican Order in Malta, studying at the St Thomas Aquinas College of Philosophy and Theology at Rabat and earning an S.Th.L. He continued his studies at the University of San Francisco, California, where he obtained an M.A. in Religious Studies. After his ordination to the priesthood in 1960 he left to join the Western Dominican Province in the United States. Fr Albert began his ministry in Berkeley, California, in 1961. After 1962 his main focus was on Campus Ministry, serving the students, faculty and staff as Director of Campus Ministry at Occidental College, Los Angeles; University of California, Riverside; Arizona State University, Tempe; University of Oregon, Eugene; University of Arizona, Tucson and currently at the University of Nevada, Las Vegas. He served on the National Executive Boards of the Catholic Campus Ministry Association and the National Association of Diocesan Directors of Campus Ministry for six years. 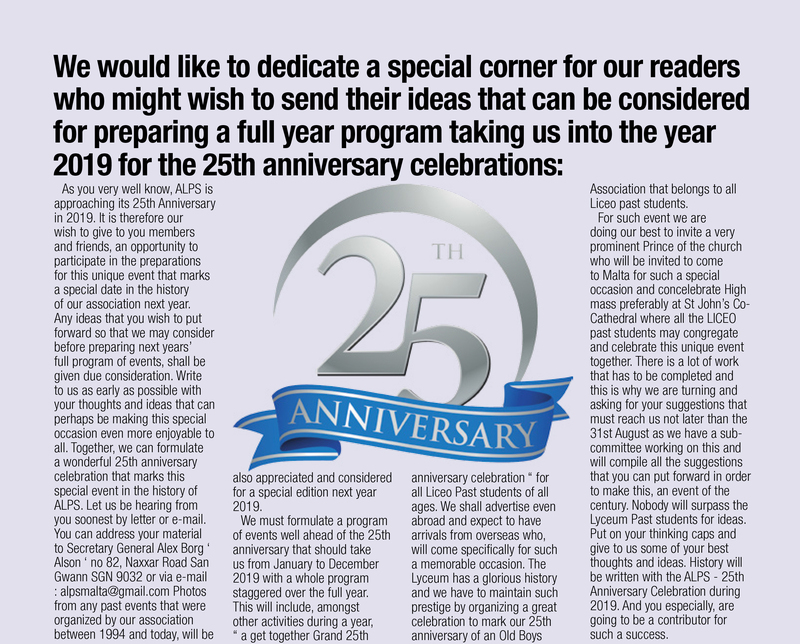 As a former alumnus of The Lyceum Fr Albert is hoping that this website can help to bring together many of the several Lyceum Past Students living in the USA. He can be contacted on e-mail at afp@juno.com or on telephone 702 274 3734. Guido Saliba, 81,who passed away on December 7, 2004 is best remembered for his deep love of drama and his great ability as an organiser. A lawyer by profession, Dr Saliba was born in Floriana on August 31, 1923. He graduated doctor of law with diplomas in public administration and in library and information studies from the University of Malta in 1966. During World War II he was a lieutenant in the Royal Malta Artillery. After the war he was appointed a master of history in the Sixth Form and at the Lyceum. Later he became head of the department of history and social studies and assistant headmaster at the Upper Secondary School. His connection with the Lyceum was cemented when in 1994 he set up the Association of Lyceum Past Students of which he was president until this year when he tendered his resignation. His close connection with ALPS, however, continued as he was made honorary president for life and was acting deputy president. President Emeritus Guido de Marco described Dr Saliba as “a man of particular intelligence whose family ties with the de Marcos were especially strong”. 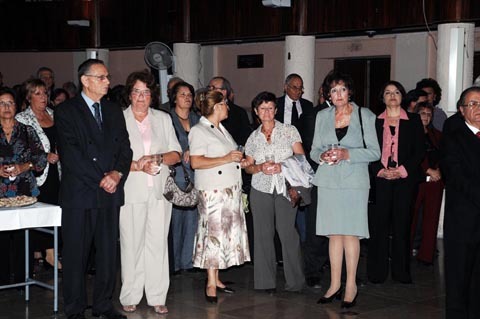 Prof. de Marco expressed deep sentiments at the great loss of Dr Saliba saying his death was a great blow to the de Marco family particularly to Prof. de Marco’s wife, Violet, the deceased’s sister. Prof. de Marco said he had known Dr Saliba since their student days at the university and he used to take part in plays produced by the deceased where he reached levels in the theatre that few have achieved since. “He was extremely creative and had a great capacity of being totally dedicated to the job at hand,” Prof. de Marco added. Dr Saliba was an actor, playwright and drama producer; founder of the Fergha Drammatika Ghaqda tal-Malti (Università); co-author with his first wife Inez Soler of Mistenni mill-Gnus, a nativity radio serial and Bin il-Bniedem – a Passion play broadcast and produced at the Radio City Opera House in Hamrun. Together with Ms Soler, he was drama and art critic for The Times of Malta between the 1950s and 1960s and used to write drama reviews under the pen-name Our Drama Critic. With his great love for drama he was chairman of the Malta Drama League and secretary of Socjetà ta’ l-Awturi Maltin. He held the post of judicial assistant at the law courts and was a Director of Studies at the Police Academy where he was one of the founders. He was chairman of the Commission for the Investigation of Injustices; a member of the Permanent Commission Against Corruption; publisher of Il-Mara Matul Iz-Zminijiet; editor of A Council for All Seasons and of A Presidency with a Purpose by Prof. de Marco and the columnist of Once Upon a Dream in The Sunday Times for the past 12 years. Dr Saliba served on several government boards including the Board of Film Censors and the Board of the Film and Stage Censors, the Board of Education, the Advisory Council of Education and the committee on recruitment policy at the Ministry of Education. George Stagno Navarra, ALPS acting president, described Dr Saliba as “a great cultured and erudite gentleman who one day dreamt a sweet dream of setting up the ALPS”. “He was a wise man and to us more than a father figure. When he was rushed to the hospital on Saturday, in spite of wearing an oxygen mask, he asked me to contact an association member in Australia to write something for the association’s magazine. “His love for the ALPS was that great,” Mr Stagno Navarra said. 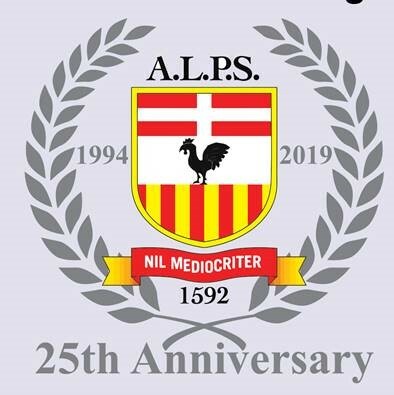 Dr Saliba was awarded the honour Il-Furjaniz tas-Sena 2003 by the Floriana local council and the Croce al Merito Melitense by the Sovereign Military Order of Malta. Dr Saliba married Irene née Camilleri in 1978. They have two children Pierguido and Yelenia. He resigned the post of ALPS president during his official speech at dinner marking ALPS’s 10th anniversary in March 2004. George S. Grech, ‘Ad Honorem’ Permanent Member, was born in Mosta on 30th July 1935 and attended The Lyceum between 1946 and 1951. He was employed as a clerk typist in the Civil Service in 1952 and then admitted to St Michael’s Training College in 1953, being appointed a regular teacher the next year. In 1961 he was promoted to Assistant Head of School and served in the Hamrun and Zejtun Primary Schools. He was appointed Head of School in March 1978 and served in Marsaxlokk, Naxxar and Hamrun (School Street) Primary Schools as well as Marsa Secondary School. On 29th August 1989 George was appointed Head Master of The Lyceum until reaching retirement age on 29th July 1996 – so he is the only ALPS Council member to date to have “stayed on” at The Lyceum for so long. He was later appointed President of the School Council of Lija/Balzan Primary School for one year and President of the School Council of Sir Adrian Dingli Girls’ Junior Lyceum for four years. In July 1959 George married Marie Louise née Bonnici and they had two sons and two daughters, Catherine, Ivan, Roberta and Adrian. George is the proud grandfather of Ramona, Kurt, Charis, Mark, Gabriella, Carl, Beppe, Louisa and Giulia. After Marie Louise passed away George married Mary Rose née Sciortino in February 1997. Fr William Bartolo, OFM Conv. NOTE: Mr Oscar Galea is also the ALPS representative on the Lyceum Bicycle Marathon organising committee. of Administration was made up as follows.